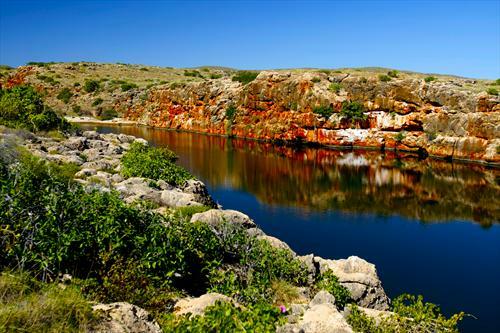 Cape Range National Park is situated 40 kilometres from Exmouth on the west coast of the North West Cape. It is one of the few areas in Australia that can boast the Range to Reef experience. The rugged stone country of Cape Range descends to arid coastal plains and drifting sand dunes, then on to the turquoise waters of the coral reefs and ocean depths of Ningaloo. Powered by energy from the sunlight, the plants and animals of these communities depend on one another to survive and provide essential habitats for rare and endangered species. Once the home of Aboriginal people, the coral coast has since been witness to historic expeditions, severe cyclones, military activity and a variety of maritime industries. Whaling and turtle hunting are now banned, but fishing, oil exploration and the production of wool continue in the region. Today the major growth industry is tourism, with increasing numbers of visitors each year. Milyering Discovery Centre is approximately 51 kilometres from Exmouth in the Cape Range National Park and is open from 9am to 3.45pm every day, except Christmas Day. The Milyering Discovery Centre has visual displays, brochures, videos and a small library for travellers wishing to take the time to peruse this facility. Drinks and souvenirs are also available at the Centre. Milyering Discovery Centre is staffed with trained personnel to assist the public and to advise of the facilities available within the National Park. A fee is payable for entry into the National Park and camping fees also apply for overnight stays. At the northern boundary, an entry station has been erected and an attendant is present for most of the day. An honour system is in place when the station is unattended and patrons are requested to pay applicable fees under this system. These fees provide the district with funds to maintain the park and amenities provided. The road within the park is sealed up until Yardie Creek which is 91km from the Exmouth townsite. Accesses to most beaches within the National Park are unsealed roads. Most roads and tracks are accessible to conventional vehicles however four-wheel drive is necessary to cross Yardie Creek. It is worth noting that road conditions deteriorate rapidly with rain and access may be restricted. Coastal dunes are easily degraded. Please use the tracks provided for coastal access, and reduce tyre pressure when driving in soft sand. To protect wildlife, the recommended maximum speed within the park is 80 km p/h, and night driving should be avoided. Driving on beaches damages turtle nests and disturbs hatchlings so please drive carefully. Special fishing rules apply for the Ningaloo Marine Park which is adjacent to the Cape Range National Park. For conservation and to abide by the law please ensure that you pick up a copy of the Ningaloo Marine Park Fishing Guide from Fisheries Western Australia before venturing to wet your line. Campfires, pets and firearms are not permitted within Cape Range National Park. Feeding of wild animals can cause ill health, aggressive behaviour and upset population numbers. To maintain nature's balance please avoid feeding native animals including marine life. Parks and Wildlife Service rangers patrol this park at all times and they are more than willing to assist or answer questions pertaining to National Parks, their Rules, Regulations and By-Laws. These Rangers are empowered to prosecute any persons offending under the Conservation and Wildlife Act. For more information please contact Parks and Wildlife Service.